Just as a strong foundation is fundamental to your home, so too is a strong 'foundation' in the science of Civil Engineering essential to our work as masonry and building contractors. And nowhere is AAP Construction's knowledge in 'Civil' more critical than in constructing your home's foundation. 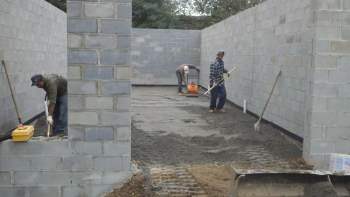 To begin with, the concrete that is prepared for a foundation must have precisely the right kind of cement paste, i.e. just the right proportion of cement and water. Making and repairing foundations since 1993 we have accumulated the knowledge to know just which type of cement to use. Next, concrete for the foundation must be made – and this concrete will not be the same one that is used for driveways or footpaths. It requires just the right mix of crushed stones, silica, shale and so forth. And lastly, the thickness and width of the foundation must suit the needs and demands of the superstructure. Want to learn more? Just call us at (973) 298-1013. Next come the excavation, footings, and drainage systems before the foundation walls are laid. But building a foundation is not only about the foundation itself – it has to be connected to the superstructure. We will use heavy-duty anchor bolts and rim joists for this purpose. And AAP Construction will not neglect the insulation for your foundation – insulation against the elements 'insulates' you from high utility bills! We have been making and repairing foundations since 1993 so you can count on us for the most crucial structure of your home. Don't delay, call us today at (973) 298-1013 for a reliable opinion and a free, fair-priced quote.